WISCONSIN ALL- TIME COMPOSITE RANKINGS for the GIRLS THROWING EVENTS. 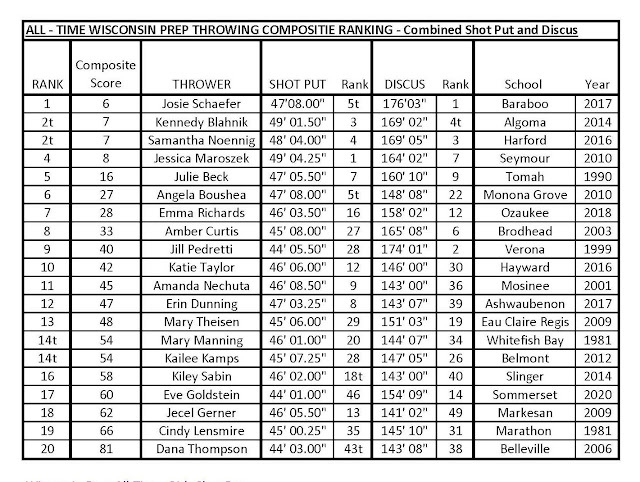 Of the thousands and thousands of prep girls who have picked up a shot put and discus in Wisconsin over the past 50 years, only 20 girls have throws that rank in the top 50 of BOTH the SHOT PUT and DISCUS events. The COMPOSITE RANKING adds each athlete's rank on the top 50 ALL-TIME LIST in both events. The lower the score, the better the combined ranking. Congratulations to Emma Richards - Ozaukee '18 and Eve Goldstein - Somerset '20 for making it on the list! Emma Richards finished her senior year strong, sweeping the WIAA D3 SHOT & DISCUS. Emma threw 46'3.5" indoors at the WTFA Indoor Championships to move up to 16th on the all-time list in the shot put. On the road to the WIAA outdoor meet Richards threw 158'2" in the discus at the Hilbert D3 Sectional, it was the 12 best throw in state history. Eve Goldstein had an impressive sophomore season for Sommerset and won both the Shot and Discus at the WIAA D2 State Meet. Her 44'1" shot put toss at the Girls ThrowDown in MadTown moved her into the top 50 in state history at #46. Eve competed into the summer and improved her discus to 154' 9" at the AAU Junior National Meet in Des Moines Iowa, good enough for #14 on the all-time list. As we continue to see massive improvements in the Girls SHOT PUT and DISCUS around the state, Elizabeth Robe got bumped off the list as her 140'9" discus P.R. from 2004 fell out of the TOP50 list, You'll still find her holding on the #34 on the SHOT PUT LIST at 45'1". #50 Shot Put 43' 10.5"
GLIDE SHOT DRILLS YOU CAN BE DOING RIGHT NOW!